Click on the dogs section. Sonar is the brother of Bosun who was recently rehomed by DBARC, and is one of three brothers who were left in a dog pound by their breeder because they don't have perfect ear carriage!! 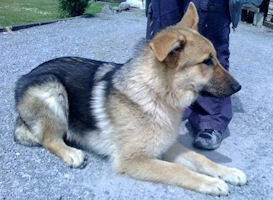 Fortunately all three were saved by a lady who specialises in GSD rescue, and with whom DBARC often works, so handsome young Sonar has come to us to find a loving new owner, someone who thinks, as we do, that perfectly straight ears are far less important than fantastic temperament - which is Sonar all over, and in fact that slightly floppy ears just add to his charm and character. 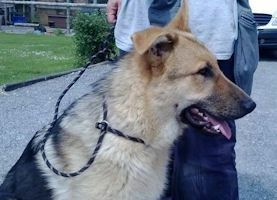 Sonar is a super, soppy, friendly boy who loves everyone. He is great with other dogs, but has not lived with cats. In his foster home he has been learning lots of stuff really fast, and his lead walking and recall are very good for a puppy of his age, but he is still very much a blank canvas, so will certainly need further training. GSDs are intelligent dogs, and need an outlet for their brains, so dog school is a must for this lad. Sonar is a very gentle chap, but is too big to live with children under 10 years. He would be very happy living with another dog. He will need company most of the time, as would any dog of his age. Sonar has found his new home.